The Living Unicorn Project was the brainchild of a couple of Naturalist/Historians: Oberon & Morning Glory Zell. During their extensive research on legendary animals for their book, A Wizard’s Bestiary (2016), they discovered the lost secret that allowed them to recreate this mysterious creature. They moved to a remote place for the safety of the animals and the privacy of the project itself and from this hide-away they were able to purchase the livestock, build the barns and facilities as well as create and develop the actual Living Unicorns. They were successful, and they introduced their Living Legends to the world in the summer of 1980. The Living Unicorns were the wonder and marvel of the Century during the 1980s. 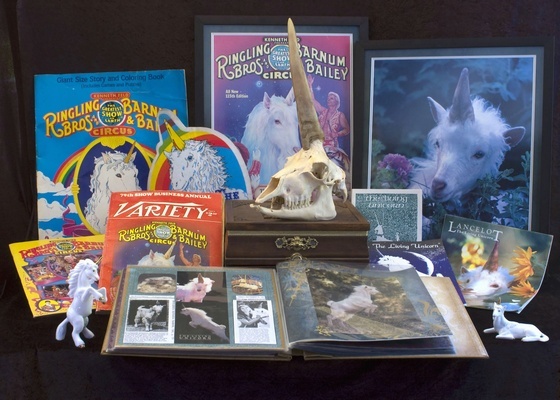 The Living Unicorn appeared on hundreds of television programs, interviews, newspaper articles and radio shows all over the world. The animals first travelled around the USA and Canada making appearances at various Renaissance Festivals as well as visits to children’s schools, hospitals, libraries and other social events. They were the subject of wild speculation and heated debate since the Zell’s kept the information about their Unicorn process a secret. In 1984, the Ringling Bros./Barnum & Bailey Circus purchased the rights to exhibit these animals in a million dollar deal and subsequently made them the centerpiece stars of "The Greatest Show on Earth" for several years, travelling all over the U.S., Canada, Europe, and Japan. 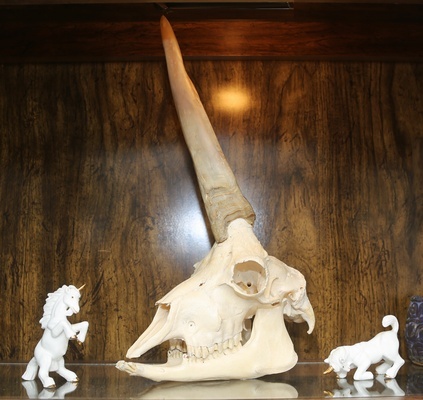 A genuine Caprine Unicorn skull from one of the Zell’s first Living Unicorns who was born in 1980, exhibited by Ringling Bros./Barnum & Bailey Circus 1984-1988, and died of old age in 1992. 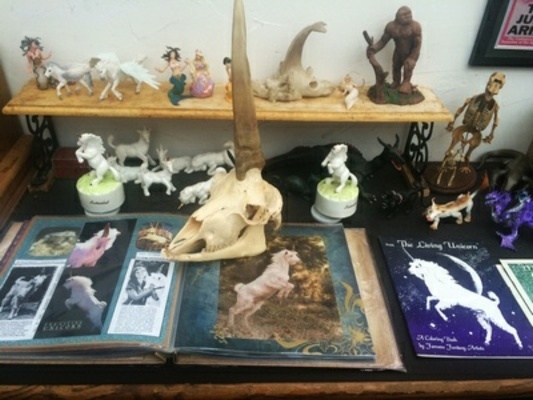 A 60-page scrapbook of the Living Unicorn saga, compiled by Morning Glory Zell. An artistic documentation spanning the entire period of the Living Unicorn’s careers. It features stunning photographs, press clippings, ads, merchandise samples, articles, parchment certificates of authenticity, mementos, etc. It includes US Patent Certificate (Feb. 2, 1984) for the Unicorn procedure.